4.5 Feet X 5.5 Feet. 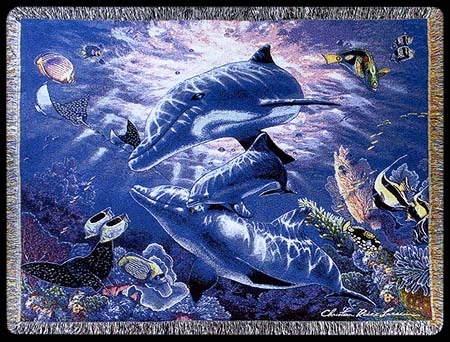 This brilliant underwater scene depicts three peaceful dolphins swimming among the fish and reef. Cristian Riese Lassen's Perfect World is weaved into this stunning afghan! It expresses an idea or feeling, beautifies, inspires and enhances our living environment. Whether it's your first piece or one of many in your personal collection, it will bring you and your family a lifetime of pleasure. Use it as a blanket, a throw, or even as a piece of art on your wall!